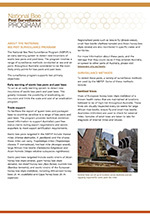 The National Bee Pest Surveillance Program is an early warning system to detect new incursions of exotic bee pests and pest bees. The program involves a range of surveillance methods conducted at sea and air ports throughout Australia considered to be the most likely entry points for bee pests and pest bees. To act as an early warning system to detect new incursions of exotic bee pests and pest bees. This greatly increases the possibility of eradicating an incursion and limits the scale and cost of an eradication program. The program is jointly funded by the Australian Honey Bee Industry Council, Hort Innovation, Grain Producers Australia and the Australian Government Department of Agriculture and Water Resources. In-kind contributions for the implementation of the program are provided through each state and territory Department of Agriculture as well as volunteer beekeepers. At a national level, PHA coordinates and administers the program. Part of the Bee Biosecurity Video Series produced by PHA and Plant & Food Research NZ, this video gives an overview of the National Bee Pest Surveillance Program. This summary document includes the objectives of the program, methods used for surveillance, the role of PHA in the program and the sources of funding.